The review contains plot spoilers. The female narrator has taken pride of place in the opening of many Doctor Who episodes since 2005, significantly with Rose Tyler's 'this is the story of how I died' introduction to Doomsday, but it has become something of a precedent in this year's five episode run. We've already had Darla's paean to the death and resurrection of the Doctor in Asylum of the Daleks and the young girl's recollections about both the Doctor and the Gunslinger that bookended A Town Called Mercy. These metadiagetic commentators can often stand outside the grand narrative of the episode, both commentating on and taking part within it simultaneously and acting as the internal subjective view of the characters. 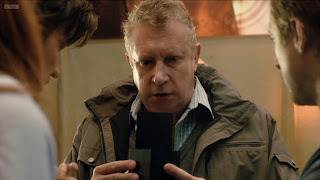 This is a device that underlines the way The Power of Three and its writer Chris Chibnall seeks to explore the emotional realism of travelling and living with the Doctor. 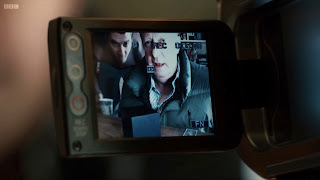 Here, the opening narration from Amy Pond/Williams also offers an immediate pre-titles comparison between 'life with the Doctor' - a montage of moments from the past three years of the series since The Eleventh Hour, rendered as Amy's memories by post-production blur and colour grading - and 'real life' - the soap drama aesthetic of phone messages from opticians, out of date milk and running out of washing tablets. For Amy and Rory the choice between their adventures and the mundanity of staying at home is, it seems, constantly postponed. 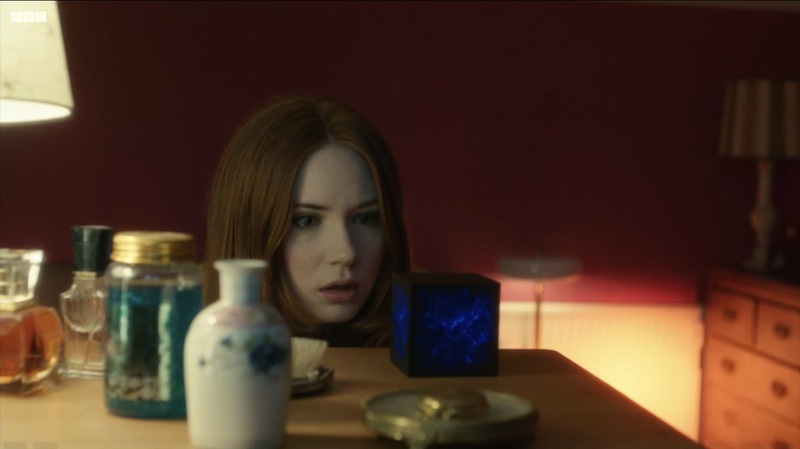 Once a methodology regularly used for the series to touch base with the reality of living in the present day and to engage the viewer at an emotional level, the Moffat era has taken a different route, rarely using the 'Earth invasion' format and concentrating solely on the developing emotional maturity of one companion, Amy Pond. 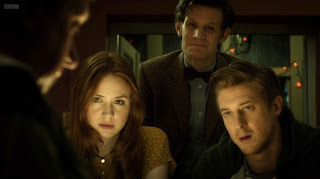 Chibnall seems to indicate that enough distance and difference exists between the Davies and the Moffat era that an unashamed homage to the Davies era can be considered and that we should take a look at 'All the Ponds, with their house and their jobs and their everyday lives' and just how time passes for them in relation to their visiting Time Lord friend. Hence, we get a return to contemporary Earth and, most specifically, the Russell T Davies contemporary Earth of Doctor Who, Torchwood and The Sarah Jane Adventures. Here, alien invasions are tracked by the media juggernauts of television and multimedia reportage (now joined by Facebook and Twitter, much to the Doctor's chagrin), celebrity commentator cameos and the Doctor's alignment with the latest incarnation of UNIT. 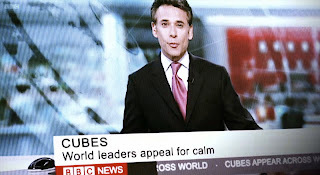 I looked in vain for the return of Lachele Carl's Trinity Wells in the montage of news reports about the 'invasion of the very small cubes' because let's face it that would have been the apt flourish to this re-use of the Davies signature. AMNN must have closed down. Instead, we had Matthew Amroliwala, Sophie Raworth and split screens depicting the cube infested landmarks of Big Ben, the Sphinx, the Great Wall of China and the Taj Mahal. 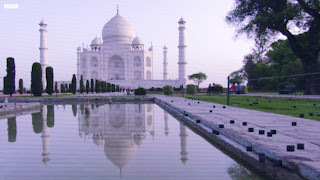 I'm convinced the Taj Mahal has its own agent negotiating these appearances as this is its third since the Cybermen popped up in Army of Ghosts/Doomsday and Jathaa sungliders marked The End of Days for the Torchwood team. 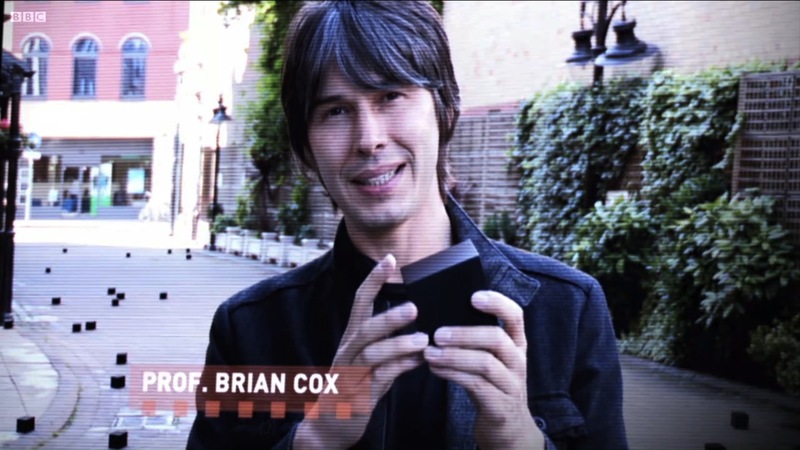 Also getting his teeth round the vexed question of where the cubes come from and retreading the trails blazed by, among others, Derek Acorah, Alistair Appleton, Trisha Goddard, Richard Dawkins, McFly, Paul O'Grady, Sharon Osbourne, Anne Widdecombe, Barbara Windsor and Sir Patrick Moore, is Professor Brian Cox. The icing on this particular cake is the appearance of Kate Stewart and UNIT. This provides something of a double whammy as far as self-reflexive texts are concerned. UNIT returns to the parent series after a long break, together with its Tower of London headquarters last seen in The Christmas Invasion ('terrible ventilation' apparently), and a new Head of Scientific Research in the form of Kate Stewart, the daughter of Alistair Lethbridge-Stewart and his first wife Fiona. Not only is this a welcome extension to the UNIT set up and history but it is also inclusive of what could be considered, until now, its unofficial history. As pointed out by Stuart Ian Burns in his review of this episode, this is one of those few instances where the Doctor Who urtext embraces the peripheries of fan created works such as the direct to video productions of Marc Platt's Downtime and David Howe's Daemos Rising. This is continuity that underlines the way in which the production of Doctor Who (itself a fan production of sorts these days) can often incorporate other, alternative fan discourses and then re-signify them as official texts. Cementing this recreation of the Davies era and its recommission of UNIT is the return of Douglas Mackinnon, the only director other than Richard Clark to have worked on Davies era episodes (The Sontaran Stratagem/The Poison Sky and Gridlock respectively) and move into directing Moffat era stories. What emerges from Chibnall's script is a sense of the Pond narrative returning to its origins and where real life might be able to begin again. Intriguingly, the episode also manages to play with the concept of time, a very specific part of the Moffat signature, in several ways. It has been ten years of adventures for the Ponds in the TARDIS 'on and off', their ordinary lives operating in real time interludes between that time machine based elastic span of existence. As the Doctor understands it, it is also the ten year journey of maturity undertaken by Amy and she is now 'all grown up', as the adult Wendy to his still youthful Peter Pan. Equally important, in its own sweet way, is the scene where he, Amy and Rory share fish fingers and custard together on the sofa as they watch The Apprentice, that particular 'pudding yet savoury' delicacy regarded as the sine qua non of the first Amelia/Doctor encounter in The Eleventh Hour. Once more, we're at the beginning of the Amy Pond story. She no longer postpones maturity as she did in her first series and there is a sense that the cycle of their Peter Pan/Wendy journey is coming to an end. When she describes herself as a journalist this surely reminds us of someone else who went on to live a life parallel to the Doctor's, Metropolitan magazine's very own Sarah Jane Smith. As this process occurs, we also watch as the slow invasion unfolds over the span of a year, with Mackinnon adding a lovely visual touch, flicking through the months like pages in a calendar and subtly acknowledging the month in various and appropriate fonts. Kate Stewart is also another analogue to Amy. The mature scientist, a nod back to Caroline John's Liz Shaw, having an impact on UNIT's evolution, dragging 'them along, kicking and screaming' into their own twenty-first century maturity. Note that Kate chooses to be known as Stewart and not Lethbridge-Stewart, demanding to be recognised as an authority in her own right and not through the privilege of her illustrious parent. 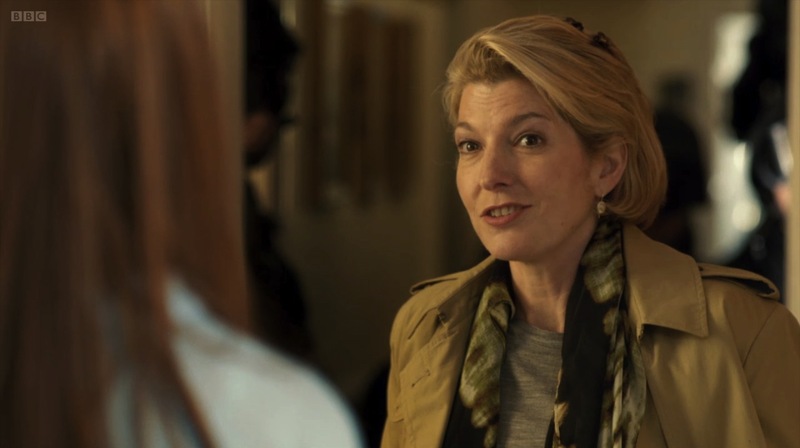 Jemma Redgrave puts in a marvellously committed performance that leaves you wanting more from the character in future episodes, as a continuation of the Lethbridge-Stewart legacy. It appears the Doctor would go mad if he even considered being left alone with his own thoughts. He's a hyperactive child who thinks everyone should come out and play without recourse to the responsibilities of jobs and homes. As Rory pointedly remarks to the Doctor, 'what you do isn't all there is'. 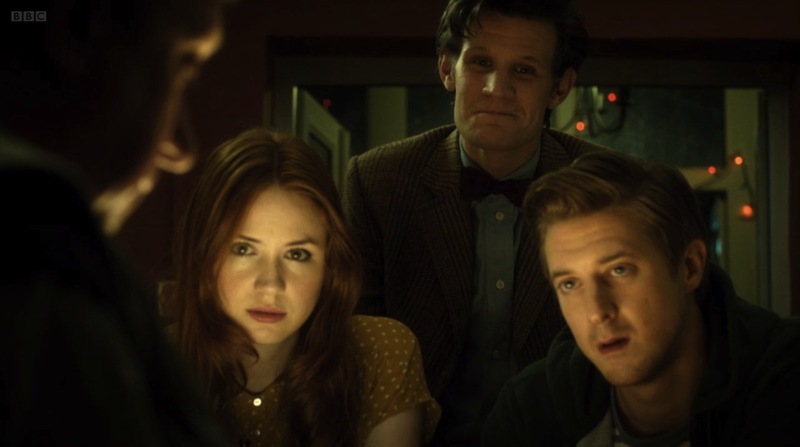 Mackinnon frames this scene marvellously using the three actors and their body language to suggest the evolution of Amy and Rory visually and their realisation that they simply can't live life at the same pace as the Time Lord. Amy has her back to the Doctor and remains stoically silent throughout. We see the months go by and observe life as it is lived by the Ponds, enjoying the important human moments and relationships. Amy is asked to be a bridesmaid, committing to the task despite having missed key moments in the bride's life and Rory is offered full-time work even though he often disappears for months. These moments suggest that human life carries on with or without them being present and the crucial notion is whether they can have an ordinary life and still travel with the Doctor. They ask each other, did real life get started because they made commitments to their friends and their employers? 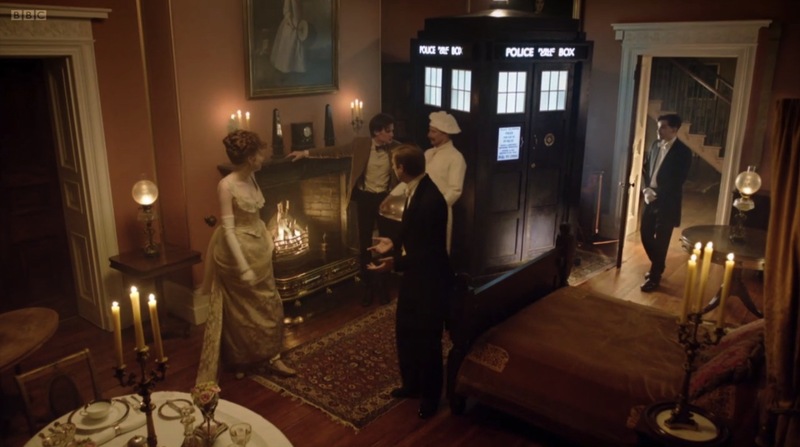 That's a moot question by the time we get to the conclusion of the episode because Amy and Rory's wedding anniversary turns into a series of celebratory leap-frogs through time, dining at the Savoy of 1890 and visiting Henry VIII, which go disastrously wrong. There's a Zygon ship under the hotel and Amy inadvertently gets married to the monarch and these scribblings in the margin of their anniversary demonstrate human moments and Doctor moments can't necessarily be separated. It's later reflected in the short scene outside the Tower of London, between Amy and the Doctor, where she admits that 'there was a time, there were years that I couldn't live without you' but since he provided them with a house, she and Rory have built a life and they may be considering this as their priority over TARDIS travels. Both lives 'pull at each other', she admits, but the Doctor makes an impassioned defence of his lifestyle, the speed of life he must use just to keep up with the universe before events 'flare and fade forever'. A lovely, quiet 'through the looking glass' moment, the scene again suggests the cycle of the Pond storyline is about to close as the Doctor explains that he keeps coming back for them because they were the first faces his eleventh incarnation saw. He reverses the point of view of his Time Lord relationship with time and space to one which is about him running to them before they 'fade from me.' It's a reflection of their mortality and the Doctor's view, as expressed in School Reunion, 'I don't age. I regenerate. But humans decay; you wither and you die'. It clearly provides Amy with pause for thought. It's wonderful to have Mark Williams back as Brian. 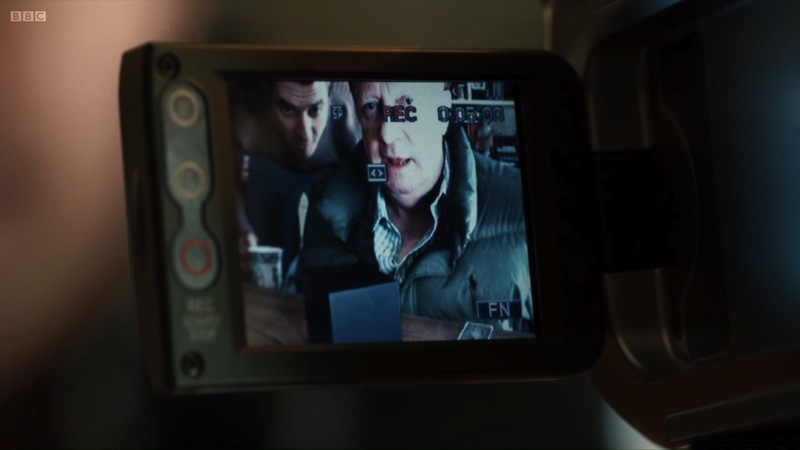 His scenes where Brian uses a video camera to observe the cubes, 'Brian's log', remind me of Elton's chat to camera in Love and Monsters, an episode about what happens when the Doctor isn't around and that shares some themes with this script. The video log is another symbol of the passing of time, where we join him on day 67, and it provides us with the warmth of the father-son relationship with Rory. 'My middle name is diligence', says Brian after he informs Rory of his researches and he rebukes his son's mocking with 'I'm doing what the Doctor asked'. Brian's log stretches to day 361 and it is through his tenacity that the world wakes up to the slow invasion. 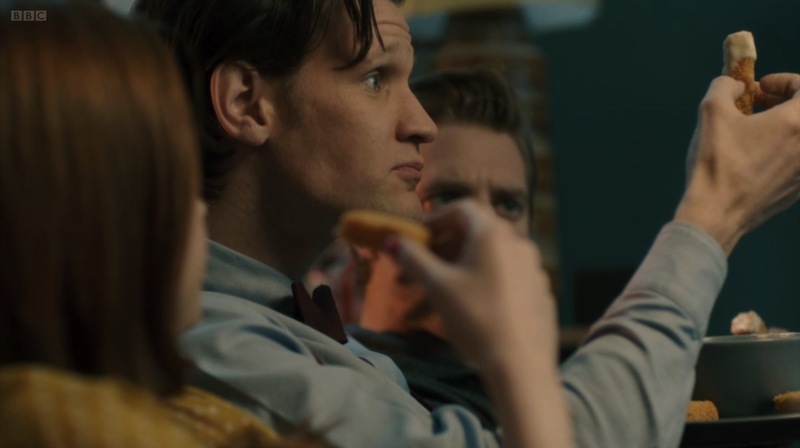 Later, it is Brian's diligence that notices Amy and Rory's little time hops back to their own June anniversary. He asks of the Doctor that dreaded question, 'what happened to the other people who travel with you' perhaps as a foreshadowing of what may well turn out to be the tragic end that the Ponds are hurtling towards. In a beautiful little scene, Williams and Smith cut through the froth and brilliantly get down to the brass tacks about how dramatically the Doctor can affect lives. 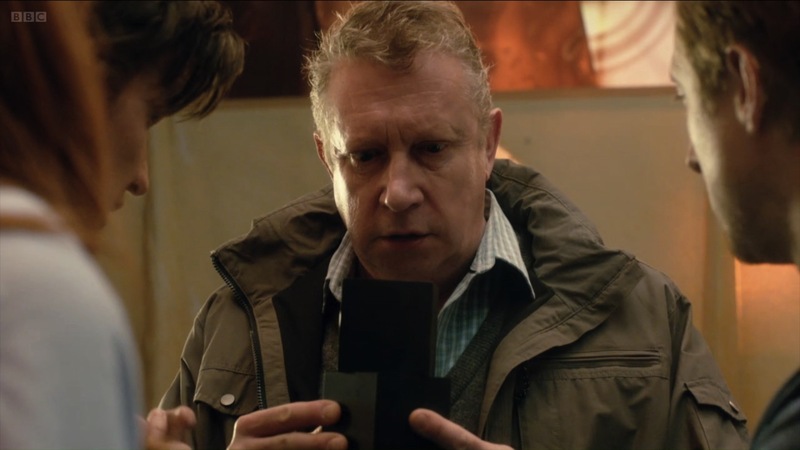 He reassures Brian that Amy and Rory will never be forgotten, left behind or die as a result of his presence but I suspect this is simply preparing us for the finality of next week's episode. The Doctor's sentimental decision to stay with Amy and Rory is merely his prolonging of the inevitable just as Amy has attempted to do likewise about growing up. The slow invasion of the cubes also reminds me of the science fiction books I read as a child in the 1970s. A particular book, Trillions, written by Nicholas Fisk in 1971, also has the Earth showered by mysterious objects. In this instance, it's an invasion of strangely behaving crystals. One of his other books, Grinny, from 1973, tells of an alien robot, taking the appearance of an elderly relative, infiltrating a family to gather intelligence about humanity and the Earth prior to invasion. It's interesting to see these similar themes in The Power of Three and how they also dovetail with the Moffat signature's use of possessed children, doppelgangers and human-machine hybrids. This renders the hospital scenes with a great deal of uncanniness as patients are carted off by humanoids looking like they've swallowed cubes, all controlled by a child with glowing blue eyes. They bear a passing resemblance to the gas-masked zombies of The Empty Child/The Doctor Dances. There is also a sub-text, in depicting the sheer ubiquity of the cubes, about the highly networked culture that we live in. The cubes are 'like iPads that dropped from the sky' and are a metaphor for the omnipresence of information technology design, digital consumerism (news reports of 'the greatest stealth marketing campaign in business history' and Alan Sugar asking his apprentices to flog cubes both wittily underline this), the creation of user generated content and the myriad apps that are pitched to us. 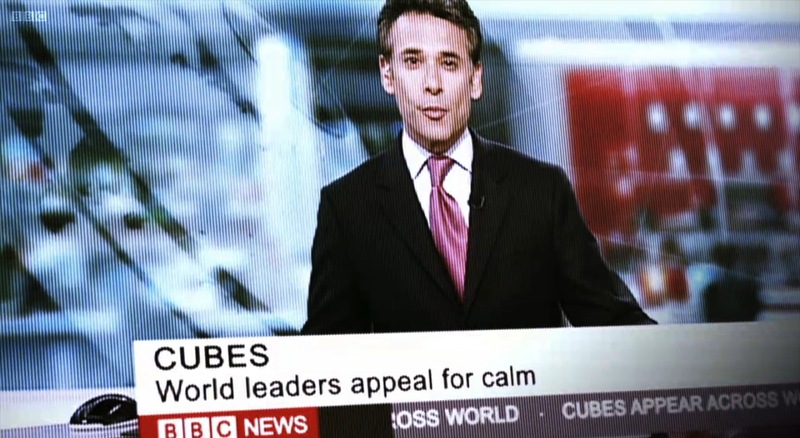 The cubes represent the ways we cope as 'digital natives' in a rapidly changing globalised mediascape. 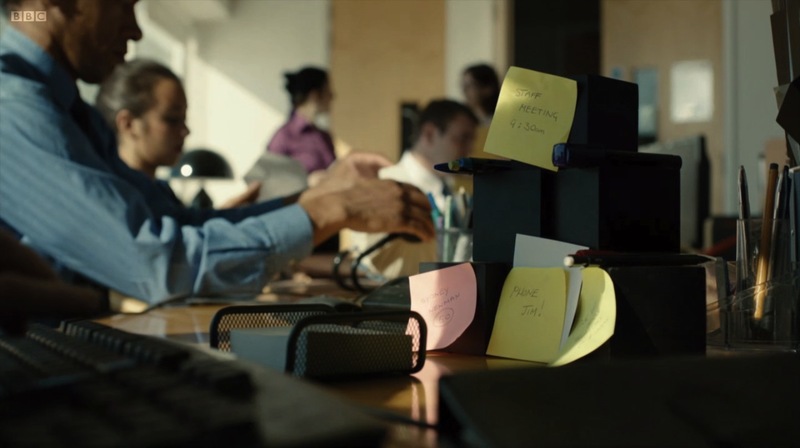 Chibnall is also suggesting something sinister behind this, where the cubes become the computers and corporations that constantly survey us, where the sharing of data becomes entwined within the virtual and real worlds and affects and shapes human relationships - from the bullying effects of the online environment to our mental and physical health and well-being. As Kate notes, citizen engagement with the cubes is achieved by 'taking them to work, taking pictures, making films, posting them on Flickr and You Tube' and inspiring Twitter accounts. 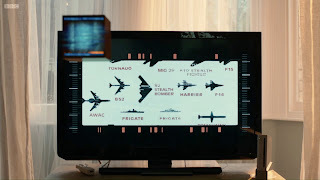 The infiltration of the cubes is analogous to the positive and negative aspects of social media as civic media, of how communication and interactivity can be used as a form of cyberespionage and Chibnall emphasises this through the aliens gathering their intelligence through the Internet televisions sitting in our living rooms. If there is a problem here it is that the cube invasion storyline is hurriedly resolved, almost as a condition of the Doctor's earlier demand that he wants the cubes 'invulnerable with a nice Achilles heel', and that's a shame as the slow build up and their completely alien and mysterious concept provide an absorbing balance to the sub-plot of the problematic intertwining of human and Time Lord lives. It's interesting that the 'nice Achilles heel' the aliens exploit in humans is purely the need for their bodies to be maintained by a pumping heart and not, strangely enough, our impending doom caused by listening to the Birdie Song on a loop. It must come close, though? The countdown, Brian's kidnapping and the mass cardiac arrests ultimately lead us to an immediate distrust of hospital orderlies, very long corridors and disused service lifts. The service lift is the inter-dimensional portal to the ship where Steven Berkoff is lurking menacingly as the Shakri, an ogre from a Gallifreyan fairy tale and an intergalactic pest-control agent threatening to destroy all human life. We're back in the realm of 'monsters under the bed' with the Shakri and the use of fairy tale motifs to warn children that there are creatures in the universe who will eat you. There's even a reference to Red Riding Hood, a motif that the series has associated with Amy since her first appearance. The Shakri is the proverbial 'man in black' for the story and yet again, like Oswin, Solomon and Kahler-Jex, he meets his demise in a massive explosion. Four episodes with the same explosive climax is becoming rather repetitive and we also have the rather improbable concept of mass heart defibrillation on a global scale. 'Creatures of hope' doesn't quite cover it. 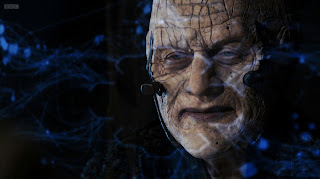 Fair dos though, this is perhaps Chibnall's best script, certainly more thoughtful and nuanced than Dinosaurs on a Spaceship, and with enough genuinely good character moments to offset some of the absolutely shameless riffing on the Russell T Davies era and a somewhat fudged conclusion with the Shakri. The episode does indeed extoll the power of three - the Doctor, Amy and Rory - and there are certainly excellent performances from all involved and plenty of material for the companions after the dearth of activity last week. Hopefully, the improved UNIT and Kate Stewart will come back again. Once more, Mark Williams steals the show as Brian, the father who can assess with pin point accuracy the dilemma that Rory and Amy face. He concludes that, like an addiction, 'it's you they can't give up Doctor' as the couple wrestle with their consciences just as the Doctor makes to leave without them. Brian gives them consent to travel in time and space but understands the need to stay grounded too, because after all, 'somebody's got to water the plants.' Ominously, he demands of the Doctor to 'just bring them back safe.' Famous last words judging by what's in store in New York when The Angels Take Manhattan. As learned and insightful a review as ever, but don't forget Richard Clark, director for the third RTD series, who returned for a couple of Moffat episodes. I think the ending was suppose to a be "joke." This episode was as much a tribute to RTD as to Pertwee's UNIT years, and at the end the Doctor literally "reversed the polarity of neutron flow" to solve the problem. If only it had been as funny as that. It might have worked. And yes, agreed, it was another of Chibnall's homages to Pertwee.